Welcome to Day Six of The Escapist's Indie Developer Showcase, a 10-day celebration of the designers and programmers who have struck out on their own to make the games they want to make. Each day we'll feature a new game or demo by an up-and-coming indie developer along with a brief interview. Some games are already commercially available, some are works in progress, but all are free to play. To see who's on the schedule or check out what you've missed, click here. Enjoy! Designer Jakub DvorskÃ½ was born in Brno, Czechoslovakia (now Czech Republic), where he still lives. After he completed his studies at the Academy of Art, Architecture and Design in Prague (with Samarost1 as his senior project), he established Amanita Design studio. Later, his former schoolmate, animator Vaclav Blin, joined him, and together with musician Tomas "Floex" Dvorak and sound designer Tomas "Pif" Dvorak they created Samorost2 and a couple of other Flash games. They're now working with programmer David Oliva, painter Adolf Lachman and a second animator, Jara Plachy, on their first full-scale adventure title, Machinarium. Click screenshot to play demo. 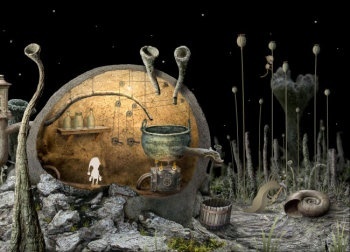 "Samorost2, the sequel to Samorost1, is a point-and-click adventure game in which a space gnome travels to a far-off perilous planet to rescue his dog from an alien abduction, and together they travel back home through another adventure. It's relaxing and peaceful game with intuitive gameplay suitable even for non-experienced players of all ages." "Luckily I'm not alone for everything. We are team of seven people at the moment; however when I started I was alone and Samorost1 was created only by me and Tomas Dvorak who created sounds. The good side of being the sole developer is that you don't have communication problems with your colleagues and everything goes quite smoothly. On the other hand, it's much better to work with a bunch of very skillful and nice guys. Everybody is good at something and is focused on it so it's much more professional work. It's also more fun to work with some people!" "I wasn't very happy with the small scope of our previous games. That's why we are working hard on our first full-scale game, Machinarium, which will be several times bigger than Samorost2." Sell the computer and become a gardener or lumberjack!